What makes Crickets so noticeable are there songs. Though they are more common outdoors, sometimes they seem to enter your home. They are good at sneaking in small spaces such as doors, windows, foundations, siding. In search of light, these nocturnal irritations may be causing a ruckus in your home or business. Fabrics may be one thing you notice being damaged. Crickets feed on cotton, linen, silk, and wool, and what often attracts them is materials soiled by food or perspiration. Plants may be another thing you notice being damaged, because Crickets will sometimes feed upon plants also. The last thing you may notice being damaged is paper goods. With large amounts of crickets, the damage may be quite serious. 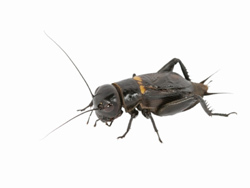 If you are noticing crickets, contacting your local Twin Cities Pest Control experts, Eco Tech, can help you resolve the problem immediately. We are trained in locating the cause of the problem, terminating the pests invading your space using our less toxic organic product line, and ending the destruction of your property.